Vintage - Salisbury Bone China of England, Tea Set in the "Thames" Pattern, 23 Pieces, Made from 1949 to 1961. 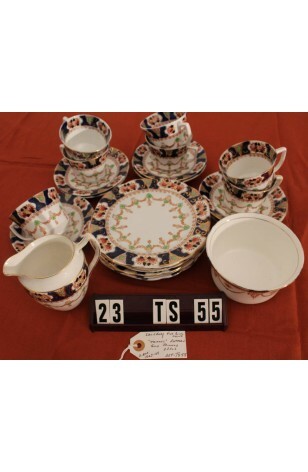 Service for (7) Seven by the Salisbury China Company of England, in the "Thames' Pattern. A Lovely Imari Style, Scalloped with Cobalt Blue Band, Rust & tan Flowers, Green Jewel shaped pattern in design, with Tan Tassels and Swags, and Tan Rope Verge. Pattern is on all pieces, with cobalt Band and Rust Flowers on the inside of the Cups as well. All Pieces are Rimmed with 22kt Gold, and the Sugar Bowl has a 22kt Gold Stripe on the Interior. Beautiful Pattern and Color. Service for (7) Seven by the Salisbury China Company of England, in the "Thames' Pattern. A Lovely Imari Style, Scalloped with Cobalt Blue Band, Rust & tan Flowers, Green Jewel shaped pattern in design, with Tan Tassels and Swags, and Tan Rope Verge. Pattern is on all pieces, with cobalt Band and Rust Flowers on the inside of the Cups as well. All Pieces are Rimmed with 22kt Gold, and the Sugar Bowl has a 22kt Gold Stripe on the Interior. Beautiful Pattern and Color. In Great Resale Condition unless noted below or in pictures. 7 - Saucers - 5 1/2"